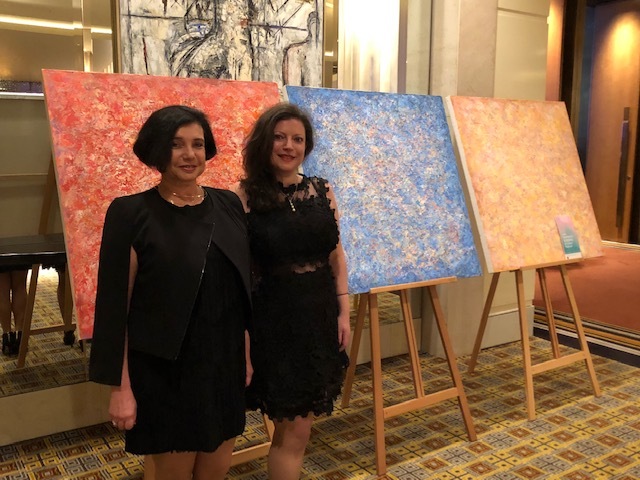 Inna Moshkovich has exhibited her abstract works in a number of solo and group exhibitions in Sydney and overseas. 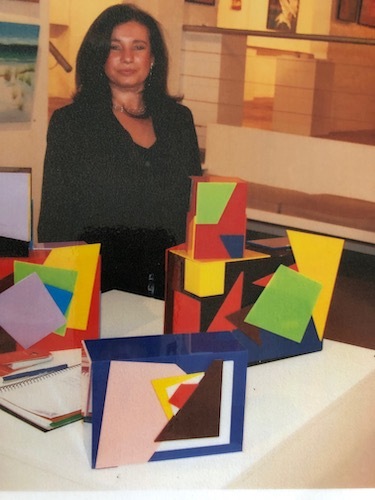 From 2005 Inna runs Art Moment Gallery in Sydney’s Bondi Beach, where she shows her own abstract paintings and sculptures. 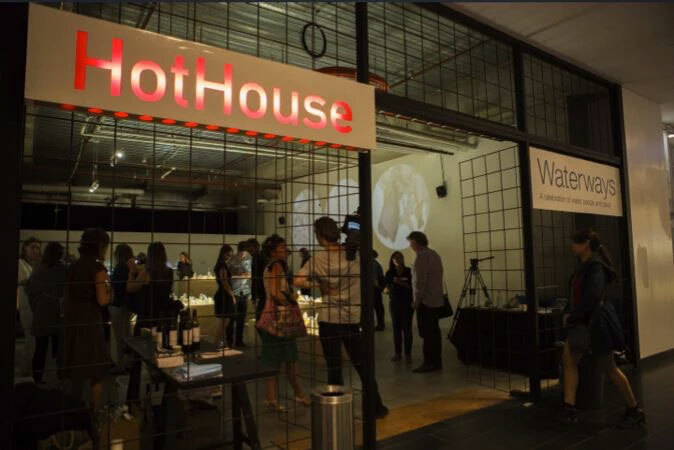 Inna Moshkovich has curated a mix of more than seventy solo and group exhibitions at Art Moment Gallery to date including curating group photography exhibitions in 2014 and 2015, which were part of Head On Photography Festival, the second largest photo festival of its kind in the world today. 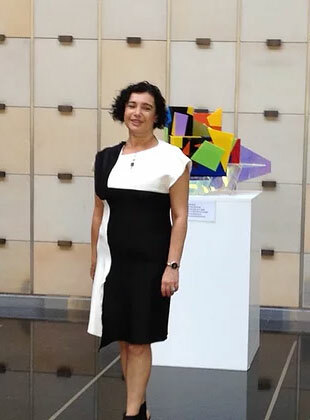 Inna Moshkovich near her sculptures exhibited at 1, Farrer Place, Sydney, February, 2013. 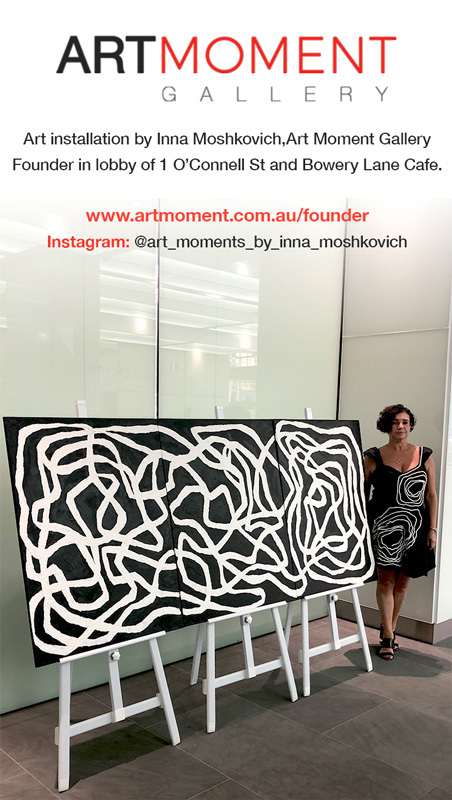 February 2019-Current -Inspired by Light solo exhibition of painting in foyer Aurora Place,88 Phillip St, Sydney, open 7am to7pm during the week, closed weekends, free entry& open to public. 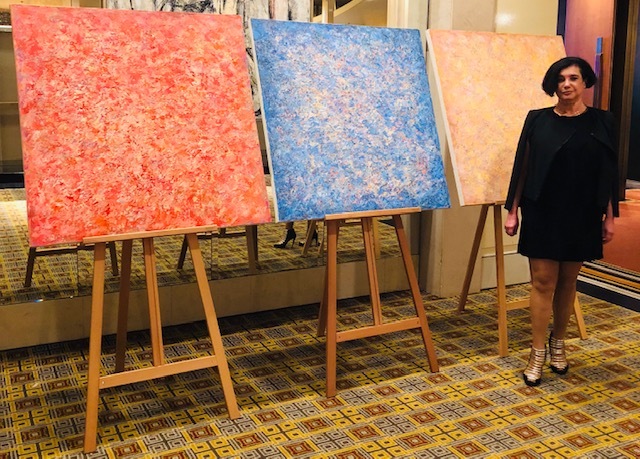 February 2019-Current – Art installation of paintings in black&white in foyer of 1 O’Connell St, Sydney & Bowery Lane Cafe next to the foyer, open 8am to 6pm during the week, closed weekends, free entry &open to public. 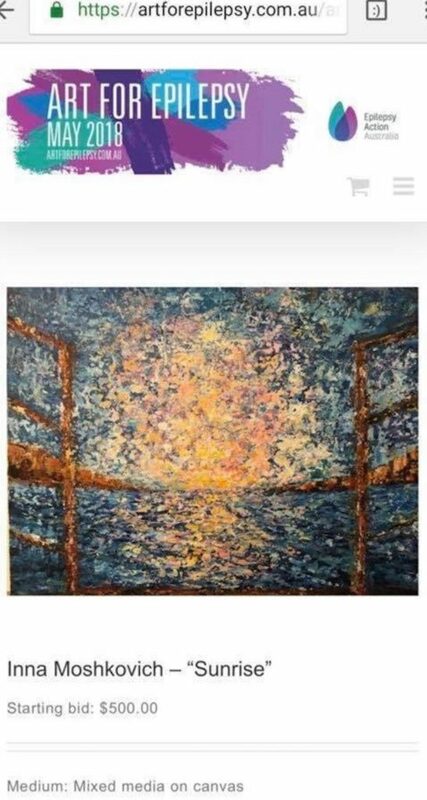 Current-Beauty of Nature, solo exhibition of painting and sculpture, Art Moment Gallery 99 Curlewis St, Bondi Beach, Sydney. 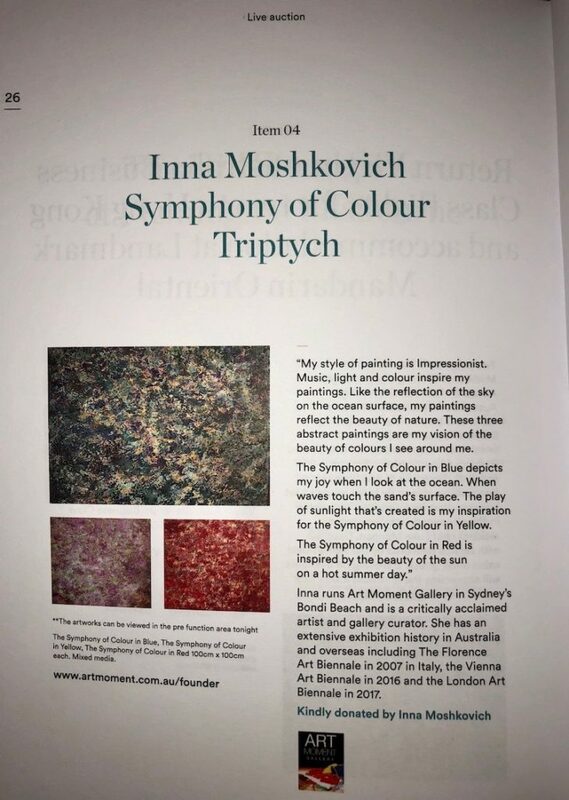 10 May 2017-23 March 2018, Symphony of Colour, solo exhibition of Impressionist and Abstract painting & latest sculptural installations by Inna Moshkovich in foyer, ground floor Aurora Place,88 Phillip St, Sydney. 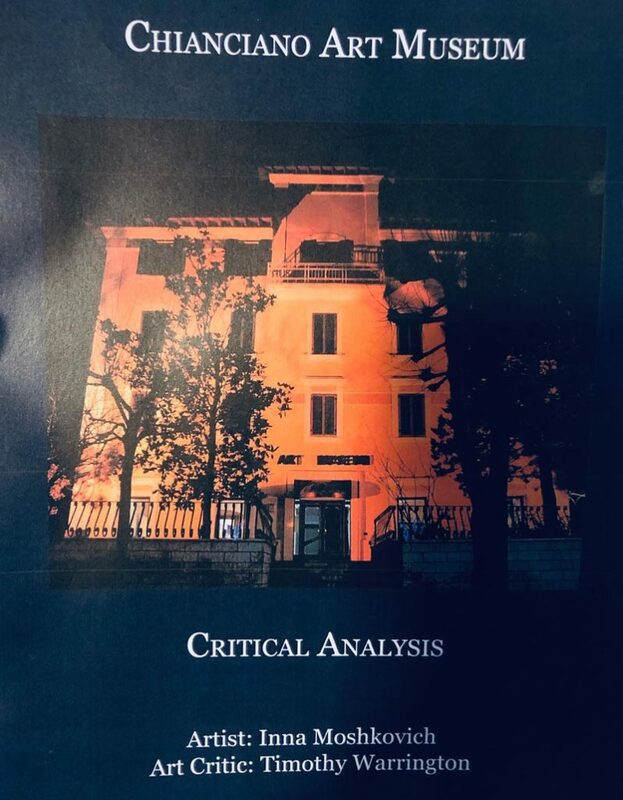 Building architect Renzo Piano. June to January 2017-Beauty in Everyday Objects – solo mixed media exhibition of painting and sculpture, using objects found in daily life as cleaning products to create artworks, Art Moment Gallery 99 Curlewis St, Bondi Beach, Sydney. 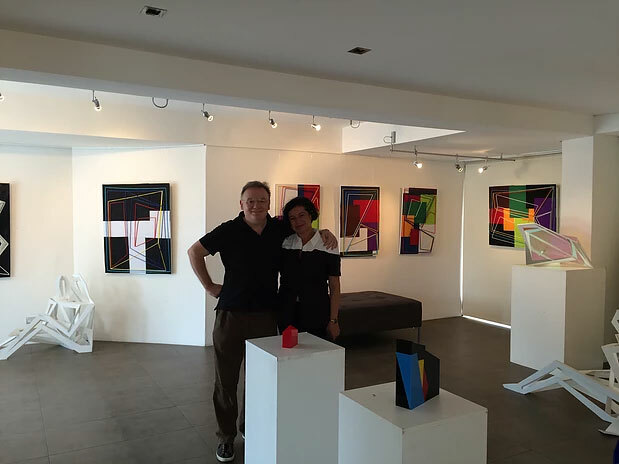 March 2015-Colourful Emotions, solo painting exhibition part of Sydney’s Art Month, Art Moment Gallery,99 Curlewis St, Bondi Beach, Sydney. 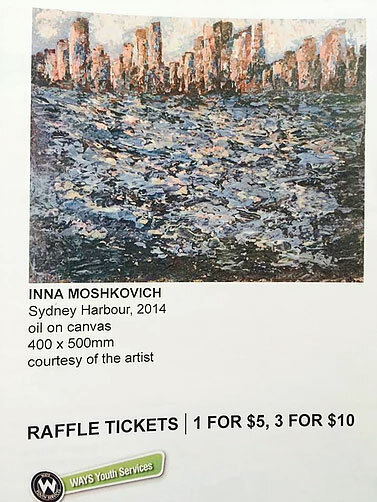 February 2013- Improvisations with Mixed Media, solo sculpture exhibition in building foyer, ground floor, 1 Farrer Place, Sydney. 2008 -Art Sydney 08, Fox Studios, Sydney. 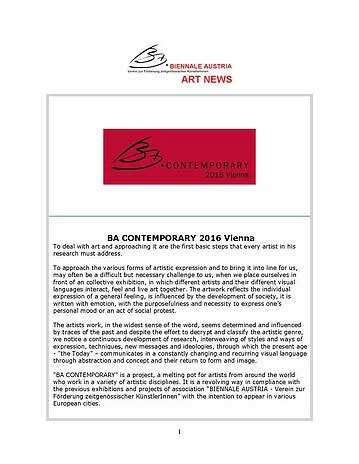 International art show with over 100 galleries taking part from around the world. 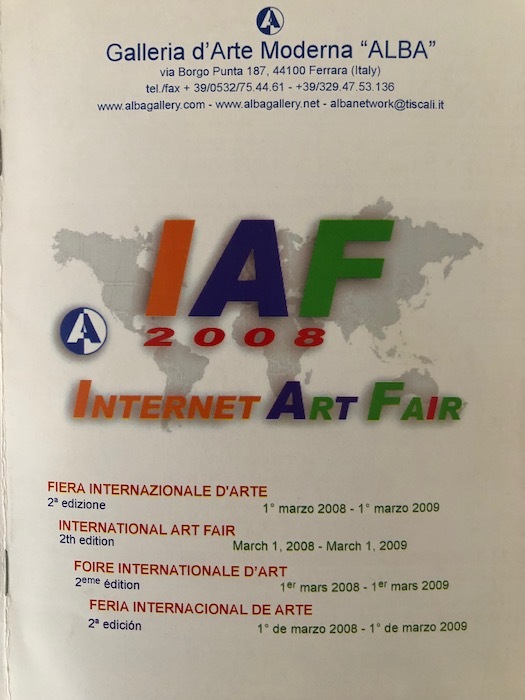 2008-New Fine Art from Australia and New Zealand, Agora Gallery, Chelsea, New York. Group exhibition of painting and sculpture, exhibited mixed media wool collage pieces, these got reviewed in Gallery & Studio Magazine, April/May 08, issue on page 27, review included in the photos below on this page. 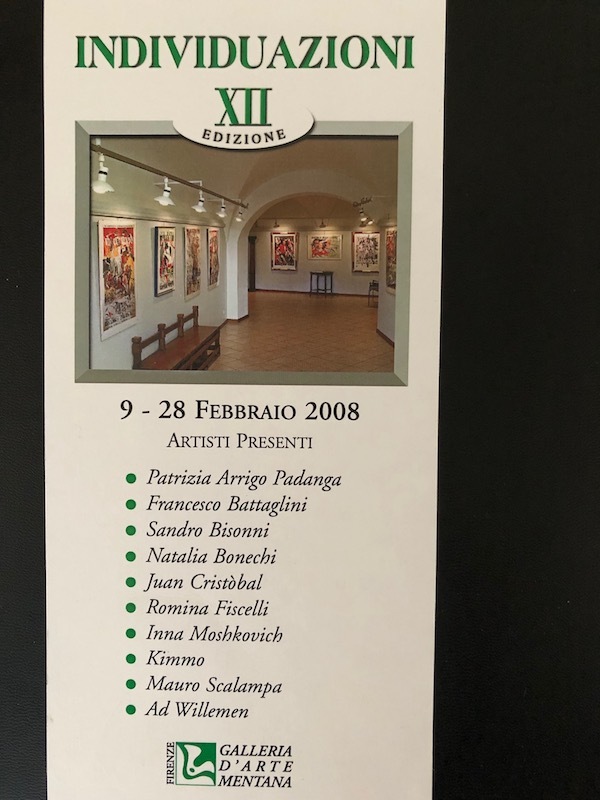 2008- Individuals Exhibition, Galleria Mentana, Florence, Italy. 2007 Florence Biennale 07, Florence. 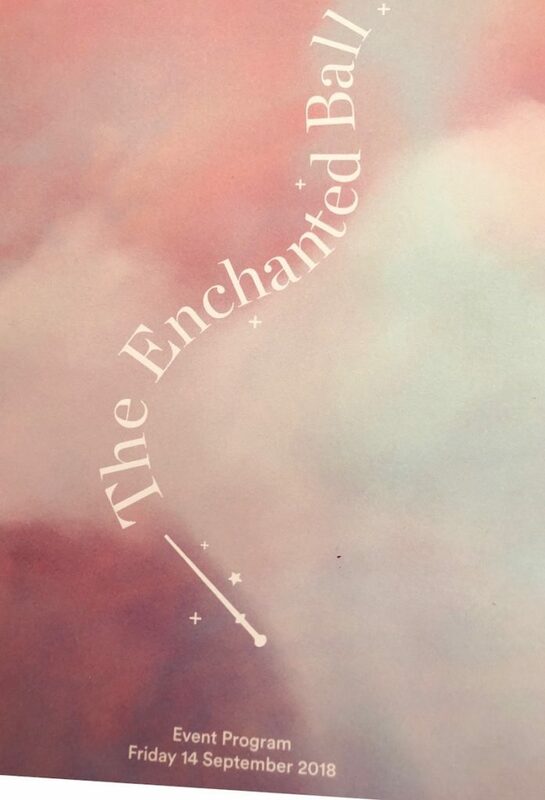 Art exhibition where to be exhibited you need an invitation. 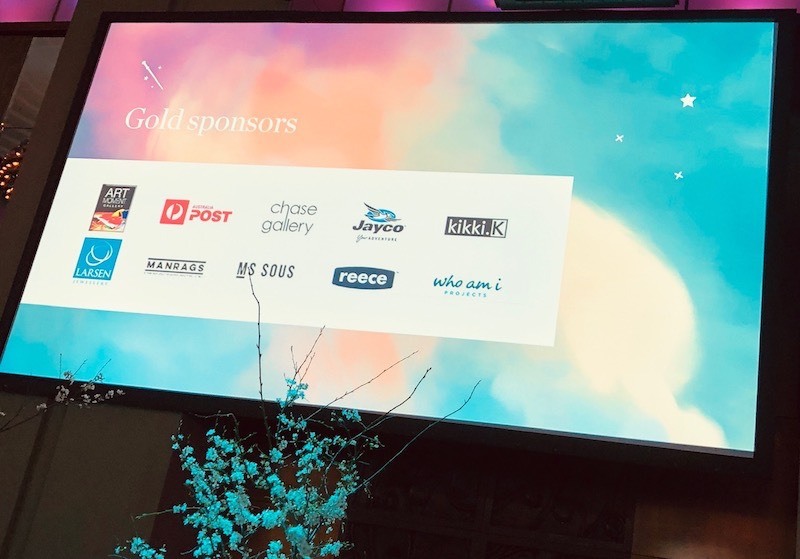 There were 2000 artists from all over the world exhibited, with 14 artists from Australia. 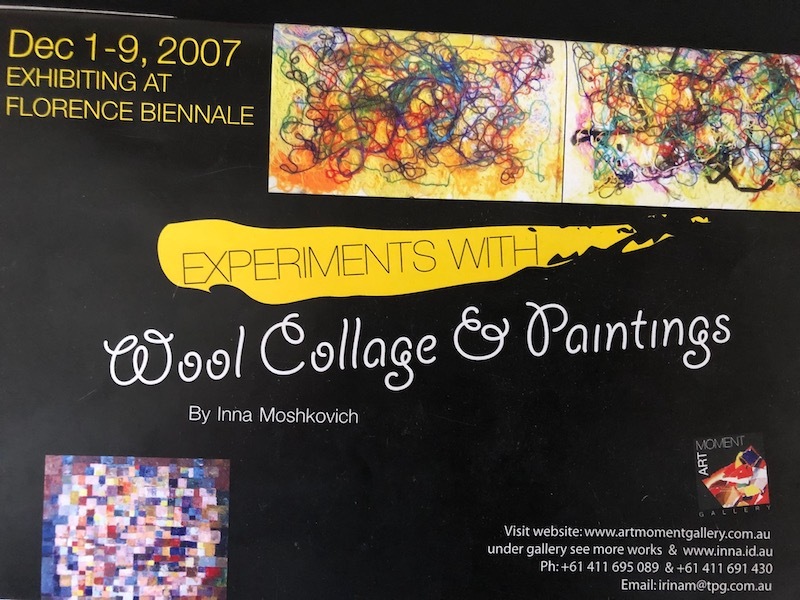 Inna Moshkovich exhibited painting and mixed media,wool collage wall piece. 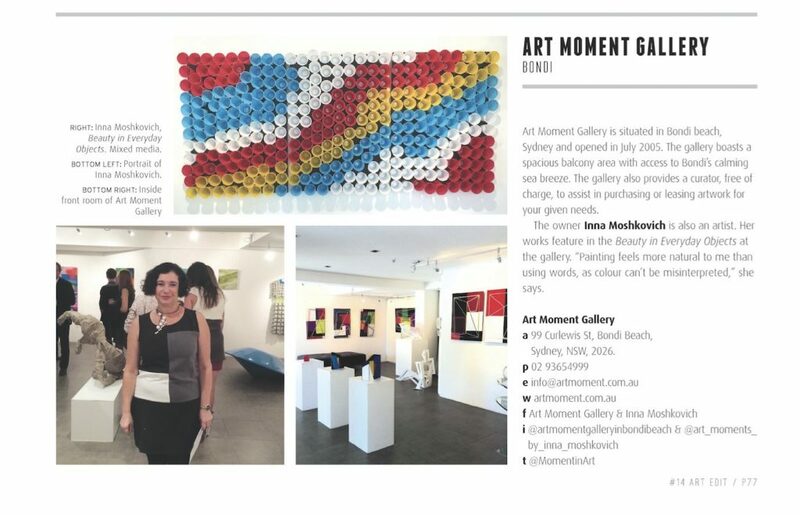 Current-Beauty of Nature, solo exhibition of painting and sculpture, Art Moment Gallery, 99 Curlewis St, Bondi Beach, Sydney. 27 September 016-Current, Sydney Seagulls sculptures exhibited in foyer, 45 Cross St, Double Bay, Sydney. 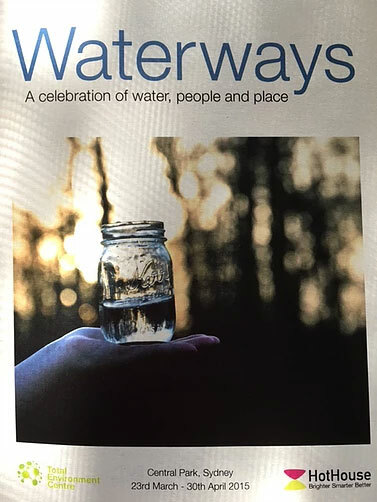 23March-4 May015, Waterways Group Exhibition, L1, Central Park Mall, Chippendale, Sydney. 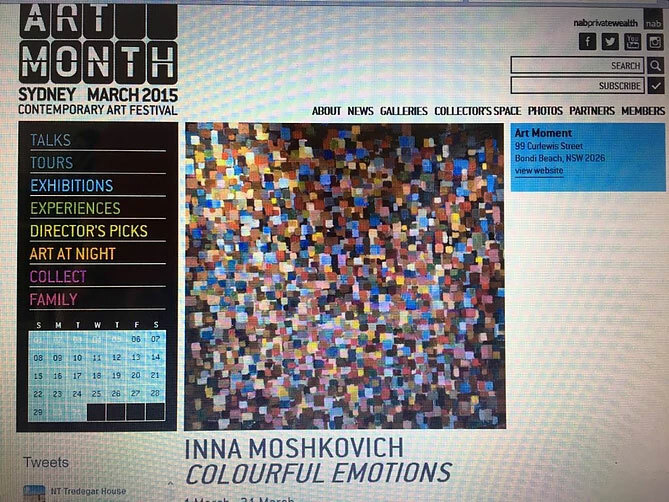 March 015-Colourful Emotions, solo exhibit, part of Sydney’s Art Month, Art Moment Gallery, Bondi Beach, Sydney. 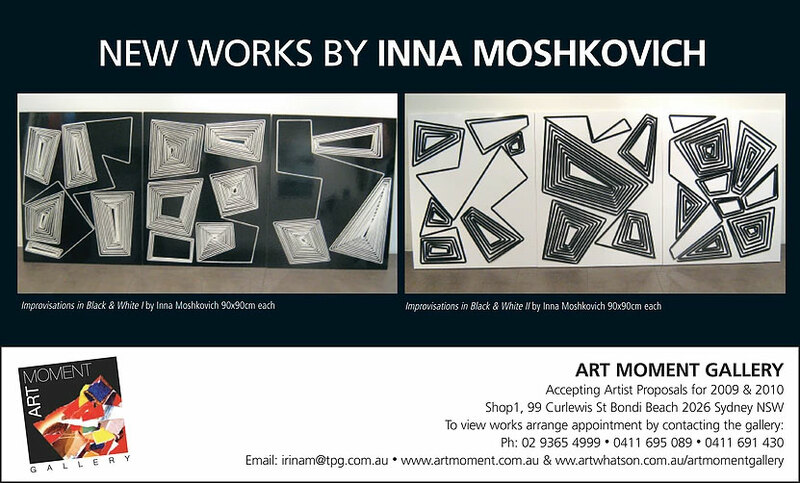 7January-10 February 2014-Moments of Improvisation, solo exhibition, Art Moment Gallery, Bondi Beach, Sydney. December 2012 -January2013 40×40 Art Prize, Brunswick Street Gallery, Fitzroy, Melbourne. 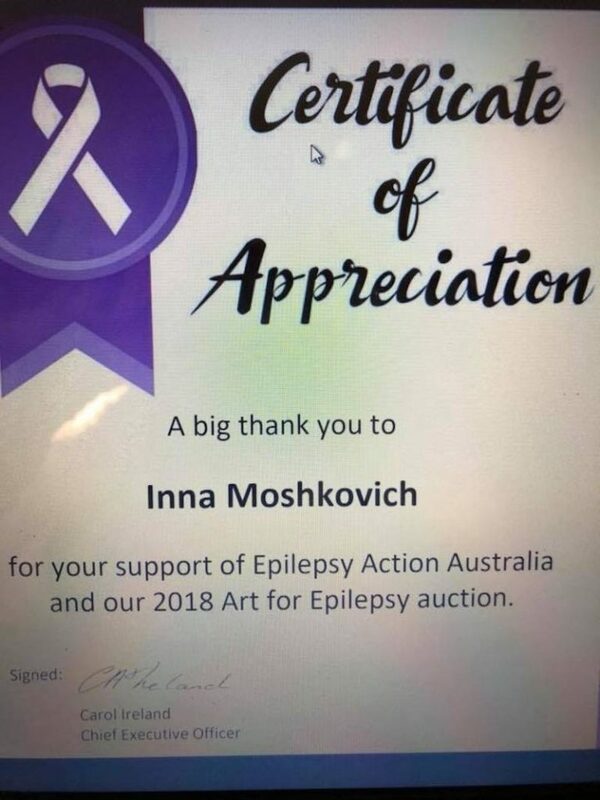 Inna Moshkovich awarded second prize out of 300 artists for her painting. 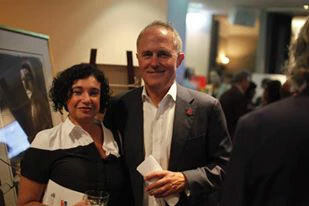 2012 – Inna Moshkovich was finalist in Sculpture and Awards Exhibition, Yering Station Gallery, Yarra Glen, Victoria. There were up to 30 sculptures selected to exhibit. 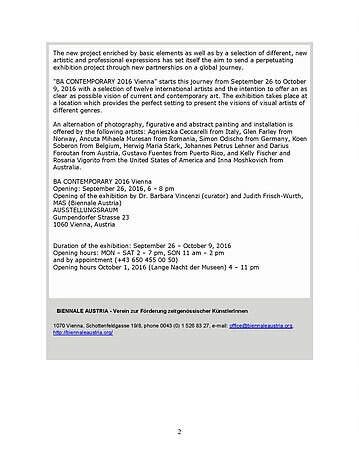 7-19 October 2010 -Contemporanea, group exhibition by artists from Australia, who exhibited in Florence Biennale in 2007, held at Smart Artz Gallery, Melbourne. 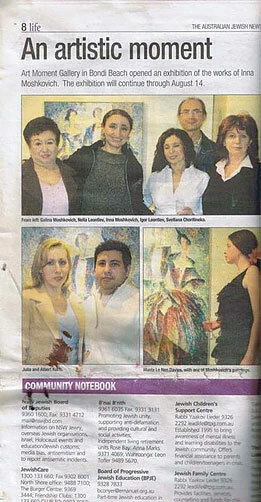 August 2010-Russian Accent Exhibition, Inna Moshkovich exhibited mixed media collage works on paper in a group exhibition of painting and sculpture at Global Gallery, Paddington, Sydney. 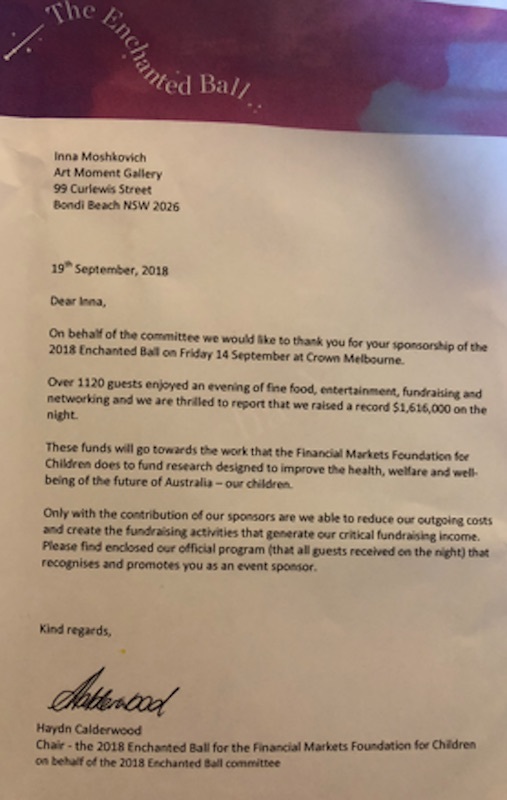 The exhibition was part of the Russian Film Festival held in Oxford Street, Paddington, Sydney. 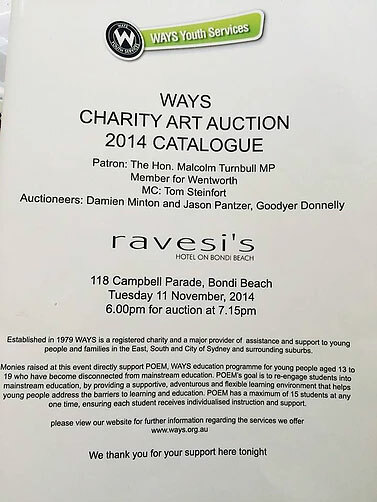 December 2009-Xmas Exhibition of Waverley Woollahra Arts School, Charles Hewitt Gallery, Paddington, Sydney. 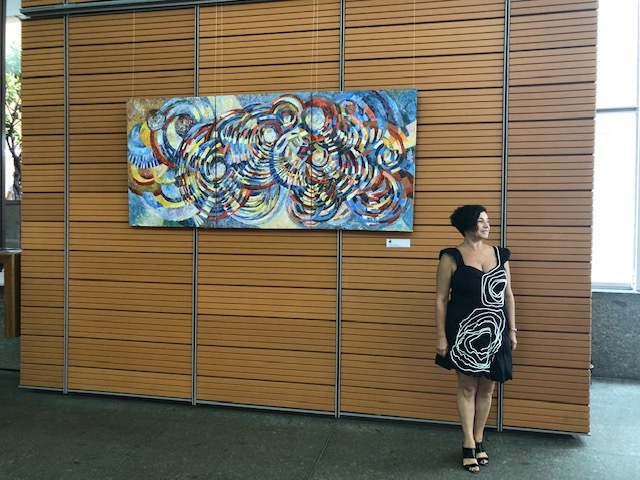 July-December 2009-Australian Pattern, mixed media wall pieces: rope and Perspex, 200cmx100cm, large scale, set of two, diptych, exhibited in foyer of Australian Institute of Management, Sydney. 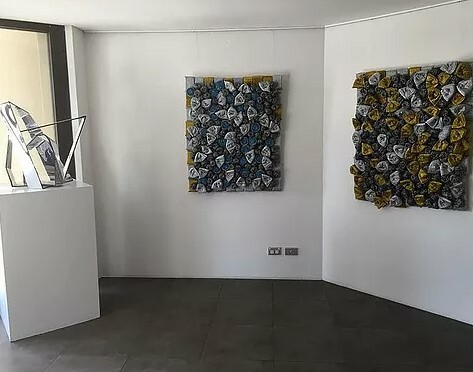 October 2017-Current, Ocean Surface series, wool collage, large scale, mixed media, wool and Perspex wall pieces at Embassy, Apartment Complex, Double Bay, Sydney, mixed media wall pieces: rope and Perspex, 200cmx100cm, set of two pieces, diptych. 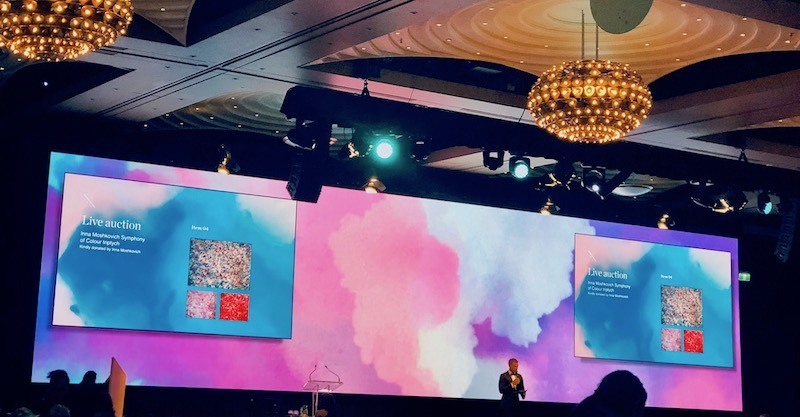 April 2017-June 2018, abstract, mixed media, wall pieces, exhibited in residential part of Pacific, Bondi Beach, Apartment Complex,180 Campbell Parade, Bondi Beach, Sydney. It’s 12 abstract wall pieces, each is mixed media: wool & Perspex, size of each:100cm x100cm. 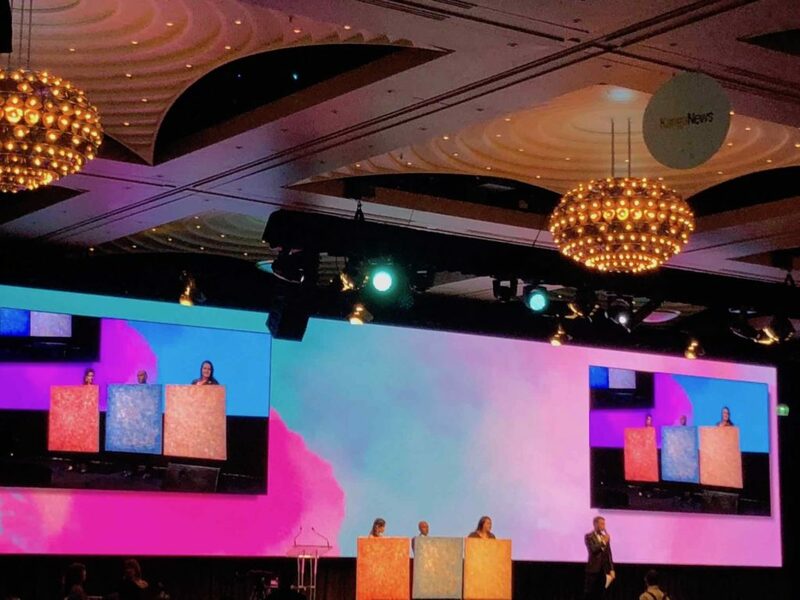 2011-Current, Australian Landscape, wall piece, mixed media: wool and Perspex,300cm long by 100 cm wide, foyer on ground floor of Quest Apartment Hotel, 28 Spring St, Bondi Junction, Sydney. 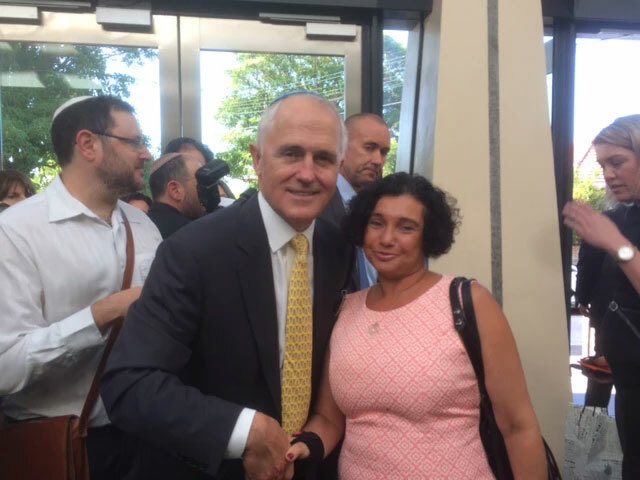 This foyer space is open to the public during the opening hours of the Quest Apartment Hotel. 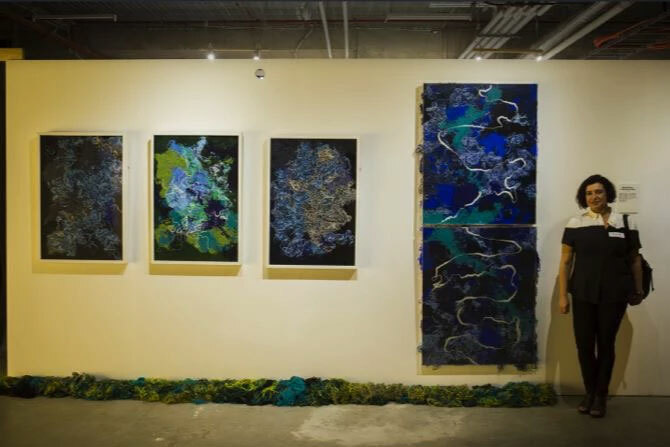 2011-Improvisations with Colourful Rope, large scale wall piece, mixed media: rope and Perspex, triptych, set of three pieces,300cm long by 100cm wide, exhibited at St Margarets, 425 Bourke St, Surry Hills, Sydney. 2011- Dancing Rope, wall piece, mixed media collage: rope with Perspex,130cm by 130cm, inside Arkadia, residential Apartment Complex,42-48 Waverley St, Bondi Junction, Sydney. 2007 -Summer Moments, mixed media collage: wool and Perspex, wall piece, 90cm by 60cm at Austrade Office, Milan, Italy. 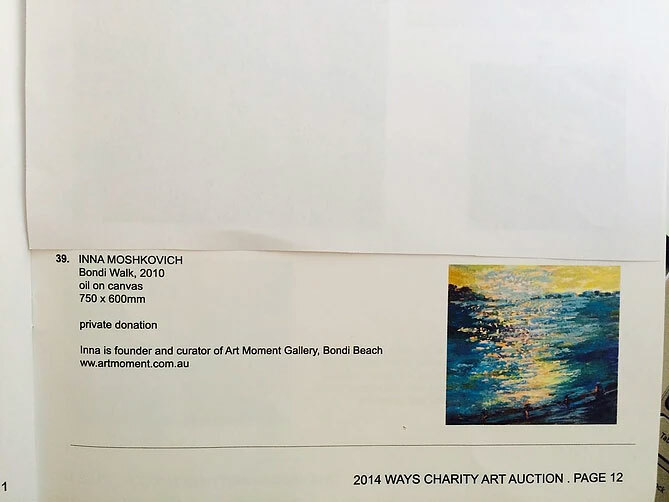 Catalogue for the London Art Biennale 2017, London, on page 102 has image of Inna Moshkovich’s exhibited piece titled Ocean Surface, exhibited in the London Art Biennale 29 March-2April 2017, mixed media: wool and Perspex, size of this wall piece: 180cm long x65cm wide x10cm deep. 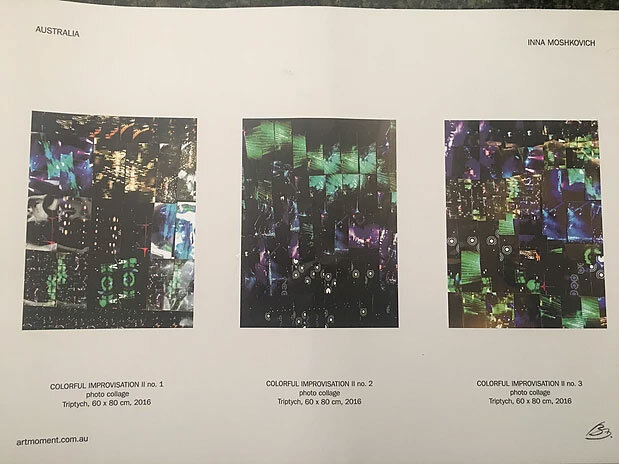 Catalogue For BA CONTEMPORARY 2016, Biennale Austria, Vienna, Austria, has image and a description of Inna Moshkovich’s exhibited piece, Colourful Improvisation II, mixed media: photo collage,100cmx90cm, September, 2016. 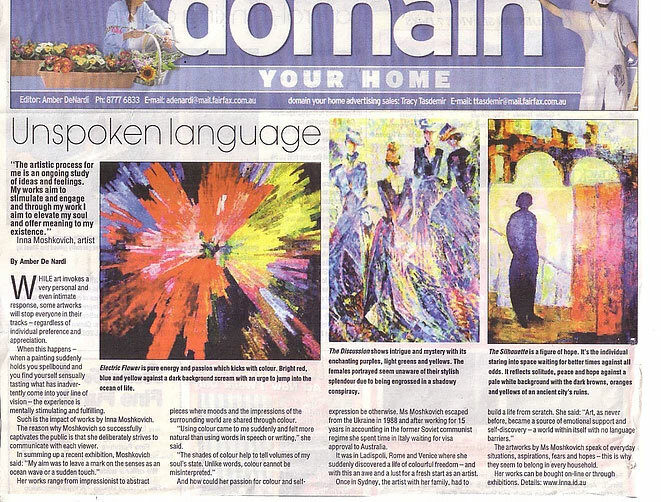 Interview about curating Mixed Media Moments group exhibition in Sydney’s Wentworth Courier,13 April 2015. Tips & Picks, NY Arts Magazine, May/June 2008 Issue, page 131, New York. 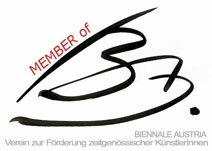 Exhibition Review in Gallery & Studio Magazine, April/May 2008 Issue, page 27, New York. 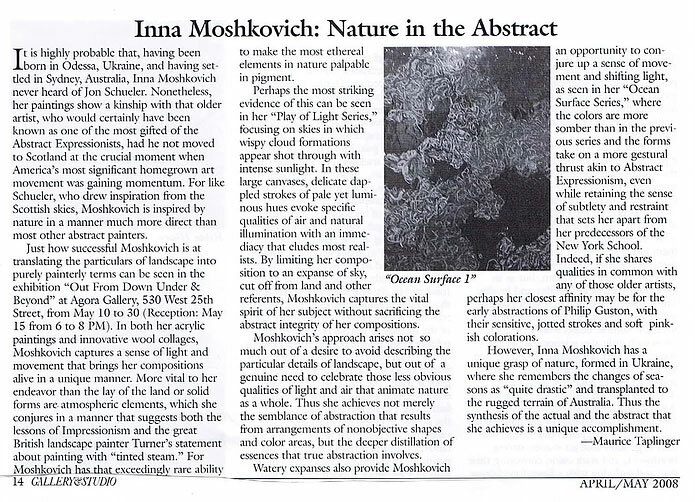 Exhibition Review in ArtisSpectrum Magazine May 2008 Issue, New York. 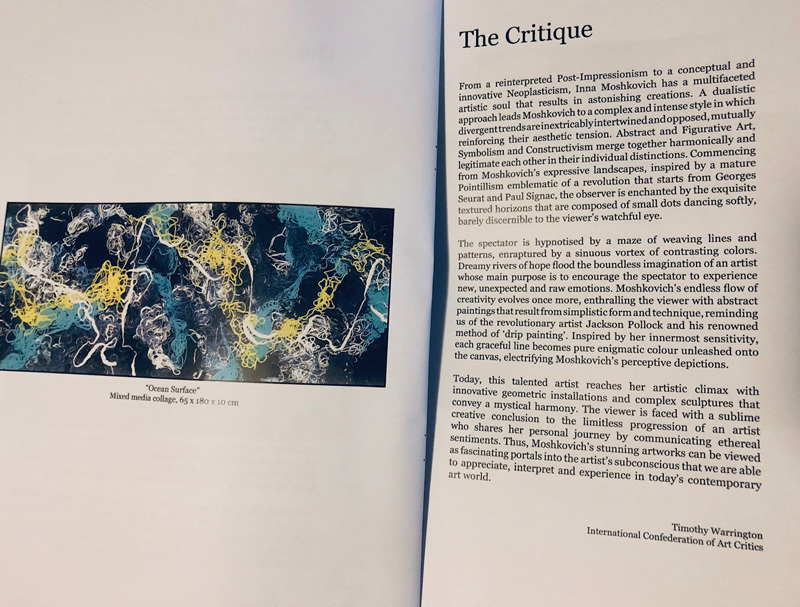 Exhibition Review in ArtisSpectrum Magazine, November 2008 Issue, New York. 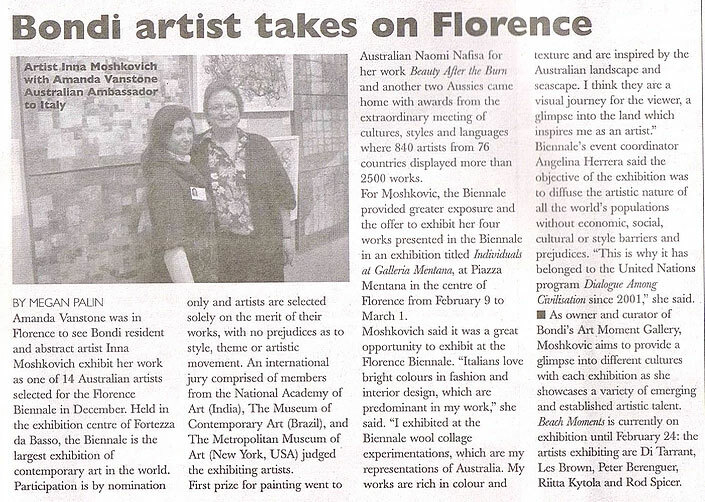 Article about representing Australia in Florence Biennale in December 2007, Bondi View newspaper, January 2008. 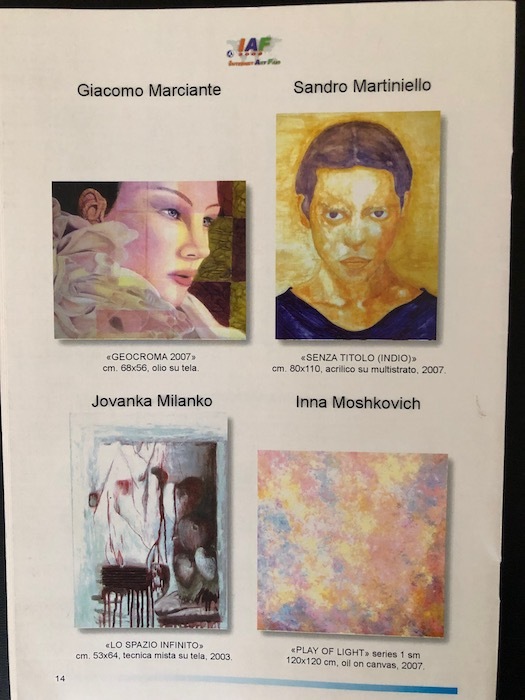 Florence Biennale exhibition catalogue, has image of Inna Moshkovich’s exhibited piece, Colourful Puzzle, acrylic on canvas,200cmx100cm, page 519, December 2007.